Since we’re planning on surviving this zombie apocalypse, it’s probably not a bad idea to have something around than can patch up our scrapes, cuts, sprains and bug bites. The best-laid plans can be brought crashing down by an untreated wound that becomes infected. Many medical kits are available (and I’ve written a little bit about this on the blog) premade for your convenience. With that being said, you are certainly capable of putting one of these kits together on your own, but that takes time. If you’d like to have a good kit, and be done with it, and get on about your day, I don’t blame and I’m here to help you out. Depending on the size of your group, your kit may need to be more or less robust, so today we’ll look at a big group kit and a solo kit for starters. 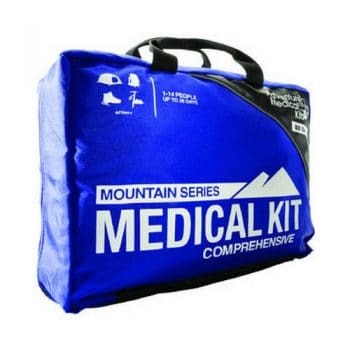 Adventure Medical Kits (AMK for short) is the industry leader in providing high quality, well thought out and efficiently packaged first aid kits. The AMK Mountain Comprehensive is designed for groups of 14 people or less, for up to 28 days in the wild. If you extrapolate that, if each of the 14 people in your group carries one of these kits, you should have about a years worth of prepackaged first aid at your disposal. The equipment in this kit ranges from dealing with blisters, to CPR to major trauma, to splinting and setting broken bones or sprains. This kit is substantial and organized to be user friendly. This kit weighs in at a respectable 3lbs 6oz, which isn’t bad at all when you consider the amount of people and length of time it’s designed for. 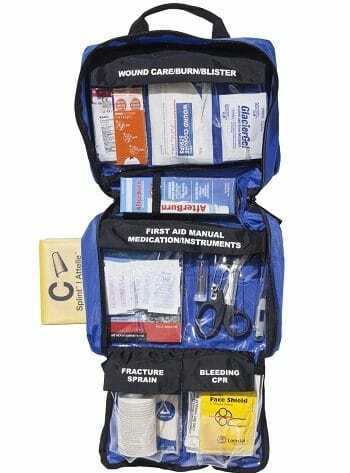 This kit is loaded with a powerful assortment of essential first aid and medical supplies for a group of 3 or less for about 1 month. It contains everything from anti-inflammatory medicines, to splints and wound dressings. A really nice feature included in this kit is a “comprehensive guide to wilderness and travel medicine”. It’s a handy reference for when and how to treat many of the afflictions commonly encountered in a wilderness environment. Weighing in at about 2lbs, this kit will efficiently get you started on your way out of the apocalypse to survival. Remember that knowing what you have and don’t have is an important part of planning any survival situation. So when you get one of these kits, open them up and take a look. Familiarize yourself with your equipment because the first time you need it will probably be in the dark and the rain, and that’s no time to try and figure out where the splints are.